The Snow Performance Stage 3 Boost Cooler® is the most advanced water-methanol injection system for your DI (direct injected) and forced induction (turbocharged/supercharged) vehicle. The Stage 3 creates a 2D injection map based off boost and fuel pressure sensor voltage to deliver the most accurate and tunable water-meth delivery on the market. Taking it one step further the Stage 3 will control 2 Hyper-Sonic™ Nozzles independently of one another to solidly the exact amount of water-methanol is provided at all rpm ranges of the engine. 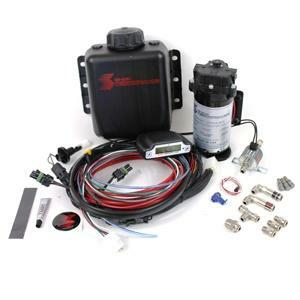 This 2D map injection and dual stage technology translate into the most accurate injection curve and tuneability of any water-methanol system giving 50-110 HP gains and up to 150 degree reduction in air temps! Tie this in with the industry leading Snow Performance 300 PSI UHO pump, Hypersonic Nozzles™, and terminated weather tight OEM harnessed wiring connections and the Stage 3 promises to be the easiest and most effective water-methanol system on the market for your DI / Boosted vehicle.